Botswana has a population of about 2 million people, according to estimates made in 2009. The main ethnic groups are from the Tswana, Kalanga and Bushmen or Aba Thwa tribes, but there are also a number of other smaller tribes as well as whites and Indians who have been settled there for centuries. The language is English or Setswana, though a lot of people who originated from South Africa prefer Afrikaans. Botswana has also been host to a number of people from Zimbabwe who migrated because of deteriorating conditions in their own country. The economy is very stable and has so far been able to sustain this influx. Native Bushmen, who live mainly as hunters and gatherers of fruit, have dwindled to less than 10,000, and the Government of Botswana has an active policy to gather these people into the mainstream of the country's living standards. A majority of the population identifies themselves as Protestant Christians and practices that faith. A single citizen of Botswana is called Motswana and the collective populace is referred to as Batswana. Botswana is a land-locked republic in southern Africa, with borders common with South Africa in the south and southeast, Namibia to the west and north and Zimbabwe to the northeast. It also has the distinction of meeting Zambia at just a single point. It is a flat country consisting primarily of the Kalahari Desert, covering over three fourths of its area. Botswana gained independence from Britain in 1966, after years as a protectorate, constantly being claimed by the neighboring South Africans. It is one of the few African countries with a very good economy, a world-renowned diamond industry, and a number of manufacturing facilities. Tourism is one of the important facets of the economy, and money visitors begin their trip in Gaborone, the capital and largest city. Botswana covers an area of about 600,000 sq km and is the 45th largest country in the world. The Limpopo river basin that dominates southern Africa lies partly in Botswana, in the southeastern part of the country. 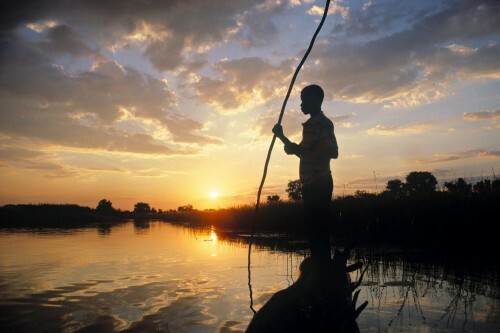 70% of the land area of Botswana is covered by desert, while the Okavango Delta, the world's largest inland delta, dominates the northwest part of the country. The topography of the country is generally flat and the climate is temperate, though temperatures in the desert regions can go up in summer. Daytime temperatures are generally about 30 degrees C, and the hottest months are October to April. Rains lash Botswana during January to March, and winter temperatures are about 25 degrees, with the desert areas known to have freezing temperatures. Batswana's leaders appealed to the British for help during the 19th century, when they had to constantly deal with incursions by Boer settlers from Transvaal, and hostilities caused by warring with the Ndebele tribes from the northeast. The country then became a British protectorate called Bechuanaland after 1885. Part of the country became a part of the Cape colony, in the northwestern province of South Africa. When South Africa was formed in 1910, provision was made to include Bechuanaland in its territories at a later date, but this was frequently postponed till the proposal finally died a natural death after the 1948 policy of South Africa, declaring apartheid. In June 1964, Britain accepted the proposal to form a self-government based on democracy, and the capital was established in Gaborone. In 1966 the country was granted independence, and Seretse Khama became its first elected president. Khana was subsequently re-elected twice to the same post. 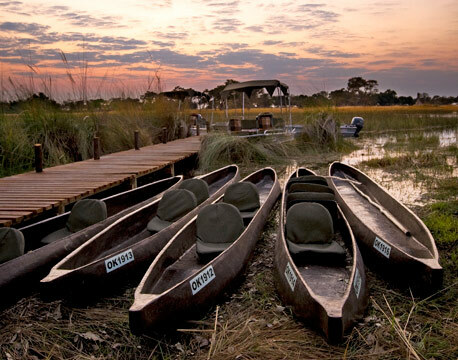 The Okavango Delta area in Botswana has the Chobe National Park and the Moremi National Park. The Chobe Park has the greatest concentration of elephants, and they are most visible during the dry season, when the elephant herds are concentrated around water sources like the Chobe River. The park also has populations of lions, leopards, buffalos, antelope, and the rare sable. Rhinos in these regions are rare, though not unknown. The Central Kalahari Game reserve is the second largest game reserve in the world, characterized by open plains, salt pans, and ancient riverbeds. 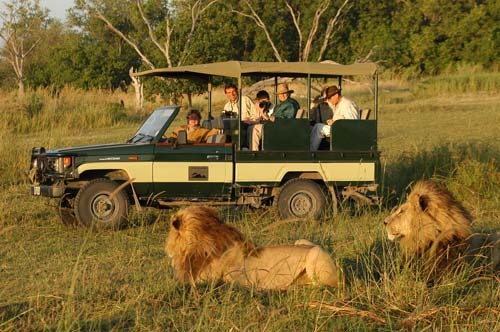 Game consists of giraffe, cheetah, leopard, lion, wildebeest, elands and a number of other species. December to April is considered the best time to visit this reserve, and visitors are advised to carry all food and water required, and travel in groups of at least two vehicles. Gaborone is the biggest city in Botswana, and has a fair collection of cinema theatres that generally show the latest movies from Hollywood at reasonable prices. Pubs that cater to the tourist population are also part of the local scene, and you can mingle with the local population or expats. Some of the pubs cater exclusively to the younger generation, and there are also a few clubs Gaborone with dress codes. Some of the clubs or lounges cater exclusively to the local population, and crowds seem to gather more outside the lounges than in them. Most of the Botswana population is practicing Protestant Christians, whereas smaller groups practice other faiths like Roman Catholic, Islam and Hinduism. 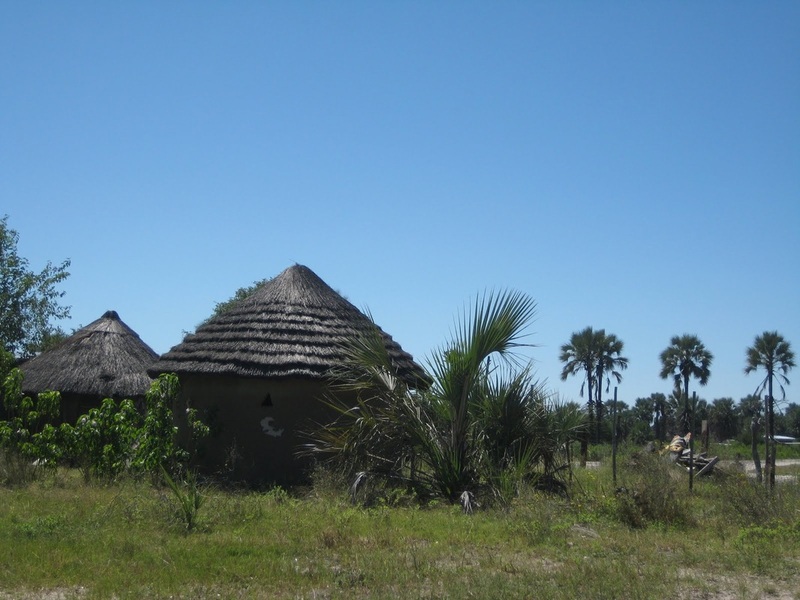 Setswana is the adjective used to describe the cultural traditions of the people of Botswana, and it is also one of the official languages of Botswana, besides English. In this language, prefixes are given a lot of importance. For example, 'Bo' refers to the country, 'Ba' refers to the people, while "Mo' indicates one person and 'Se' refers to language. The musical tradition of the Tswana, one of the main ethnic groups, is generally vocal and makes use of heavy stringed instruments without the accompaniment of drums. Rock paintings dating back thousands of years can be seen in the Tsolido Hills in the Kalahari Desert. Crafting baskets for local use and sale to tourists is also another attraction in Botswana. Seswaa is a traditional meat dish made for special occasions, cooked by men. The meat is cooked in a three-legged iron pot with only salt and water, and the mixture is simmered until the meat becomes soft. Home grown chicken is also cooked in a similar way, and the offer of a home grown chicken to a guest is considered an honor. Fish is also quite a favorite in Botswana. Supplies of vegetables are seasonal and this has led to the practice of drying and salting the vegetables for use at a later date. Recipes for cooking such dried vegetables vary greatly and may have been handed down in families for many generations. Bogobe is a porridge that is a staple part of the Batswana diet, made by adding sorghum to maize or millet flour and cooking it slowly in boiling water. The variations of this dish use fermented sorghum or maize with milk and sugar, but such porridges are also made from sour milk and a cooking melon. Dishes made from tubers or worms are also a common part of Botswana cuisine.